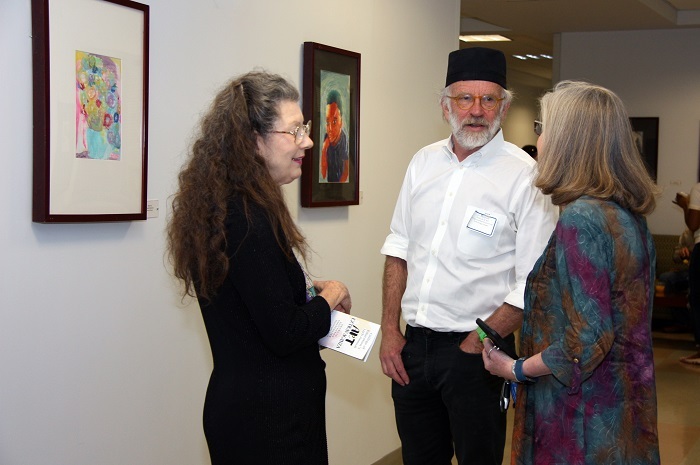 2018 Art Extravaganza guest speaker John Jensen, MFA and wife (left) discuss student artwork with local art teacher. Students from regional P-12 schools filled the College of Education (COE) classroom building on Sunday, March 4 to see their artwork displayed on the walls of the first and second floor hallways. The 14th Annual Art Extravaganza showcased nearly 40 new pieces of artwork submitted by students from 13 elementary, middle and high schools. Each year, the COE invites art teachers to submit the school’s top three pieces of student artwork. The College then spotlights these exceptional students and their art by framing and displaying the artwork in the building for a year. To signify the opening of the new exhibition of artwork, the COE hosts Art Extravaganza as a “gallery” opening and recognition ceremony for featured artists, their supporters and art teachers. 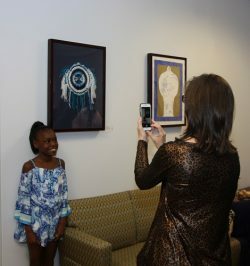 Student artist poses for picture with her artwork. This year’s ceremony featured Georgia Southern University art professor John Jensen, MFA. An expert in ceramics and sculpture, Jensen spoke about the importance of art and the necessity of finding a career you can enjoy. He displayed several of his own art pieces and highlighted the joys of serving as a professor of art at Armstrong State University and now Georgia Southern. Contributing schools included: Sallie Zetterower Elementary; Metter High; Brooklet Elementary; Portal Elementary; Portal Middle/High; Mill Creek Elementary; Statesboro High; Dublin High; V.L. Heard Elementary; Southeast Bulloch Middle; Lyman Hall Elementary; and Richmond Hill Middle Schools. Art Extravaganza began in 2004 as an initiative to recognize student art and the work of certified art teachers, many of whom are Georgia Southern alumni. Each spring, a new exhibit opens and the artwork remains on display for a full year. The Art Extravaganza is sponsored by the College of Education.